Comedian, TV personality and Book of the Month guest judge, Craig Ferguson, created some funny videos endorsing his March Selection, “The Moor’s Account,” and really, the Book of the Month Club. If you are a subscription junkie AND a book lover, you have to join The Book of the Month box. 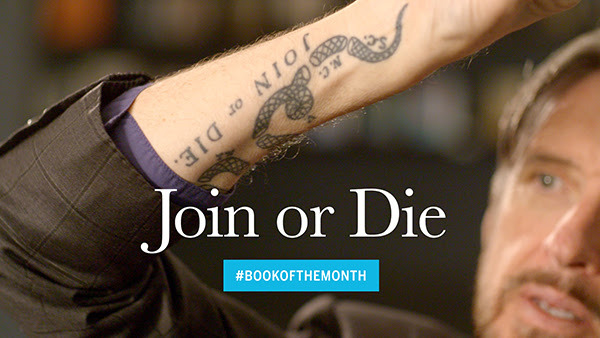 The Book of the Month boxes that members will receive in March will include a custom BOTM “Join or Die” temporary tattoo, based on the “Join or Die” tattoo that he got when he became U.S. citizen. To correspond with this, Craig created a great video encouraging members to post a picture featuring their temporary tattoo (or a real ink of their own!) with their BOTM selection on Facebook, Instagram, or Twitter. BOTM will select the favorites and apply 3 free months to their membership. Here's what I love about the Book of the Month box - you get to choose from the lineup of books and I think the price is more than fair. I picked "All Things Cease to Appear" for my March Selection. What will you choose? Use code: BOOK10 to save $10 off your membership!